← Winter Bulls on the Peace! 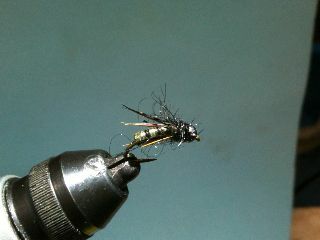 Here’s a dandy little combo nymph river fly pattern. 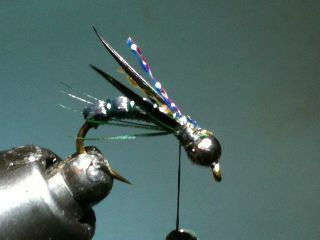 Designed for flowing water, the combo nymph has some weight to it, some flash to it, and it kind of resembles a bunch of different trout food found in streams and rivers. 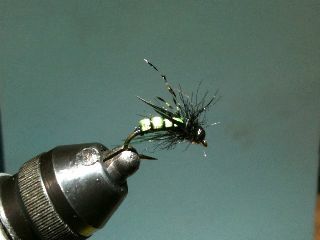 This version of the combo nymph river fly pattern in black and green I think can represent little black caddis ( nymph and diving females), beetles, stoneflies and possibly big carpenter ants. 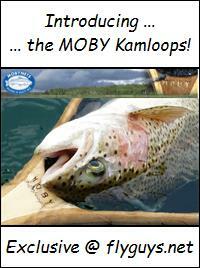 Anytime you can cover more than one base your hook up rate should increase! Wishful thinking? 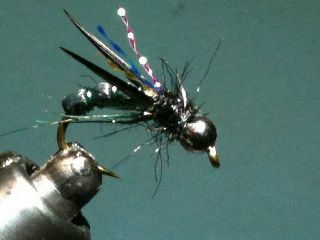 Who knows but this is a good river fly pattern to go to when there is no apparent hatch. 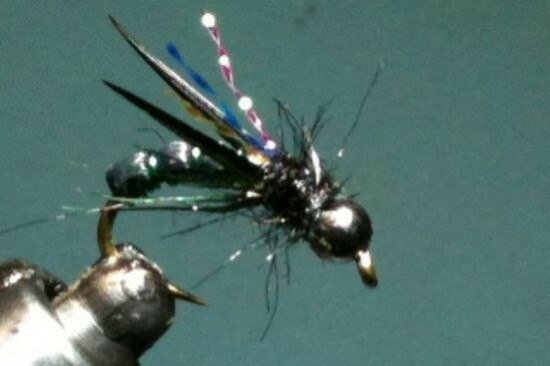 The basic design of the combo nymph allows for tons of different colours and materials so don’t be afraid to mix and match with what you have kicking around the bench. 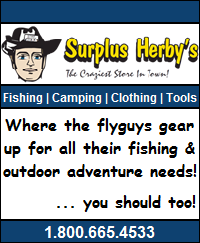 Let’s get tying! 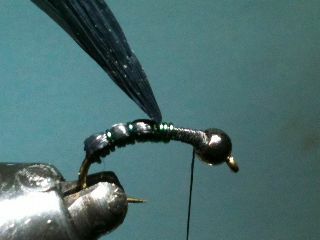 Pinch down your barb,slide on the bead and start your thread behind the bead. 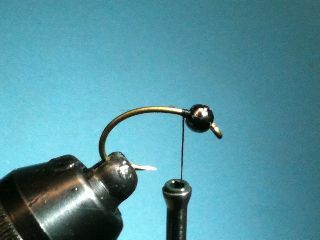 Attach the wire behind the bead and cover with thread down to the bend of the hook. Continue wrapping thread 10 -12 wraps creating a thread bump past the wire tie in point then move thread ahead of the wire For hook size 10 to 12 unravel the rafia and split in half. Tie rafia in just ahead of the wire. Wrap the wire forward in front of the rafia 3 times. 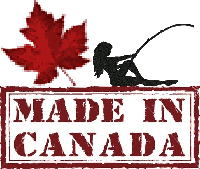 Pull rafia forward and secure with a single wrap of wire. 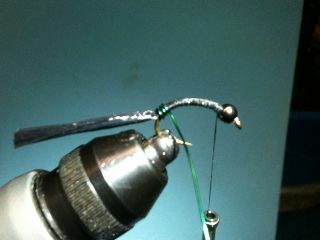 Continue up the hook with 3 wraps of wire, pull rafia forward, secure with wire until you have 4 segments. Secure rafia and wire with thread. Snip off excess rafia and helicopter wire until it breaks off. Tie goose bigot on either side. Then tie 3 -4 pheasant legs on either side. 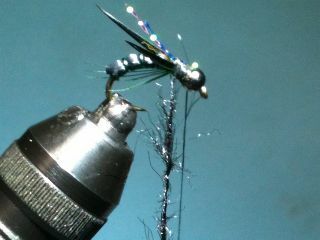 Tie 3 strands of super flash on top. Make a dubbing loop and twist up a small amount of fire lite. Wrap forward 3 times and tie off behind the bead. Snip off excess, whip finish and apply cement to thread. Here’s the view from down under! 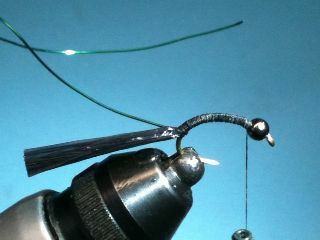 Here’s a black wire with olive scud back on top. 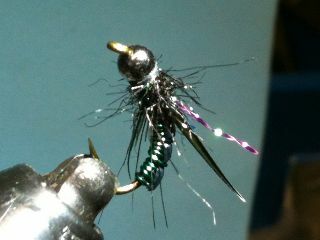 This one is black wire and chartreuse rafia. 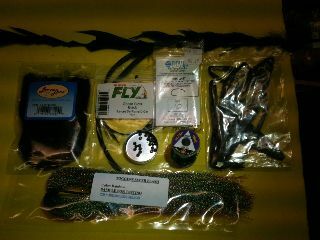 This entry was posted in Attractors and tagged Attractors, Combo Nymph, FGN, Fly Patterns, River Fly. Bookmark the permalink.